We present live classical music performances to the public. We use our online presence as a backstage pass into our world, and our work with virtual reality technology allows you to immerse yourself in the music. OK, now the detailed part...after a combined 60 years in classical music, we have found some elements of how the industry is portrayed, marketed, and presented (think about how opera is showcased in every James Bond movie...) that we are not fond of. It’s cool that classical music is viewed as elite or “fancy”...but it hurts our chances of engaging new audiences. Most of the time, when we talk to people about classical music and culture, they say they don’t know enough, or they don’t own a “ball gown,” or it’s not accessible...which is understandable when you see how the industry is advertised to the general public. In many ways, modern marketing (or lack thereof) has turned classical music into something it’s not: a high brow culture that isn’t for everyone. Trio Kavanáh: CLASSICAL MUSIC IS FOR EVERYONE. By removing traces of elitism, stuffiness, exclusivity, and judgement, we present the public with a welcoming environment to enjoy classical music, our community, and their entire evening. We discuss the music without “educating,” and we perform on the same physical level as the audience. Then we add amenities to make you as comfortable and happy as possible (this preps you to absorb the music): comfy seating, food, drinks, ambience, etc. Classical music is for everyone. "Kavanah" is an ancient Hebrew word that specifies the intention and sincerity of heart needed for effective and honest prayer. We wish to express this in our music. 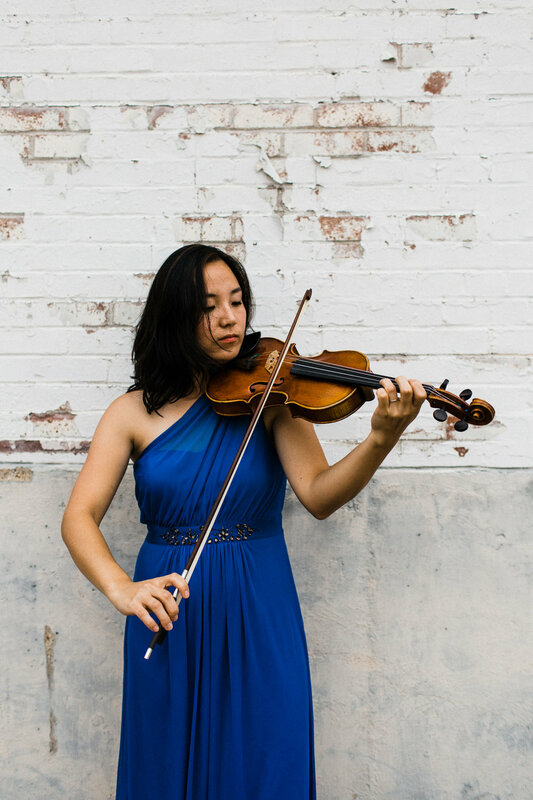 Rising violinist Grace Kang Wollett is one of the newest members of The Dallas Opera Orchestra. From South Korea, Grace began her violin studies at the age of eight in Nottingham, England. Eventually, she would move to New York City by herself at the age of fourteen to pursue her dream of becoming a professional violinist. Trevor Hale, native of Dallas, Texas, has received an extensive musical education during his career. He has earned a Bachelor Degree in piano from the University of Colorado in 2009 and a Masters from the University of Texas in 2011. Most recently, he obtained a Doctorate of Musical Arts in piano under the tutelage of Marc Durand and Jimmy Briere at the University of Montreal. Danny Goldman is a multi-faceted musician, clarinetist, and producer. He most recently became a core member of The Dallas Opera Orchestra and is also the liaison to the Board of Directors. Danny plays chamber music across the country: most recently, Brahms' Clarinet Quintet with The Amaryllis Quartet during The Chelsea Music Festival, Schoenbergs' Pierrot Lunaire with The New Fromm Players at Tanglewood Music Center, and Barber's Summer Music at the Basically Beethoven Festival in Dallas.